Rhythm N' Blooms Releases Its Full 2019 Lineup! Back in November, Rhythm N’ Blooms announced five of the headliners slated to play on the main stage in the festival’s 10-year anniversary coming up in 2019. 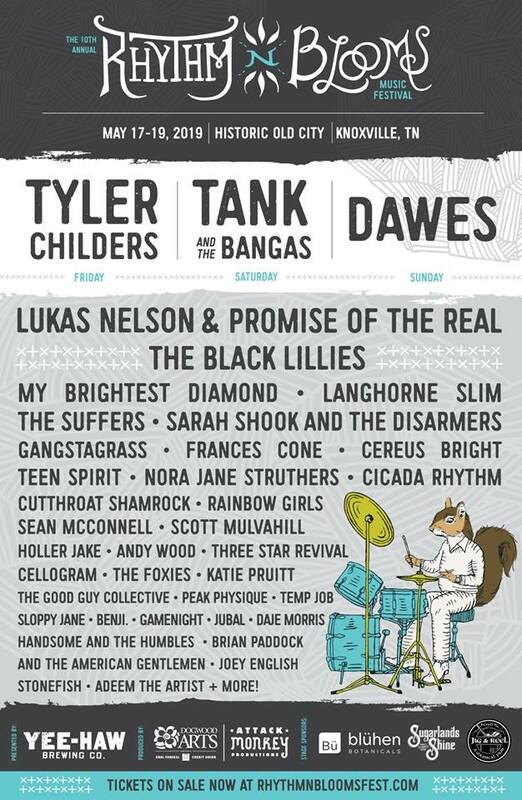 Today, the fest has announced the rest of its lineup, and holy moly, it’s pretty great all the way down to the bottom of the poster. Starting at the top, Tank and the Bangas, the winners of NPR’s Tiny Desk contest in 2017, will be the Saturday headliner sandwiched between the previously announced Tyler Childers on Friday and Dawes on Sunday. Filling in the bill right underneath the three main headliners are a Rhythm N’ Blooms all-star cast from over the years. The Suffers, Gangstagrass, Langhorne Slim, Sarah Shook & The Disarmers, Norah Jane Struthers, and Haller Jake all gained a lot of notoriety in the community of Knoxville concert-goers with legendary performances at their respective fests. It was fun to go through this list of bands and reflect on seeing all these bands turn heads and win over hearts at RnBs past. It’s not just a Rhythm N’ Blooms Greatest Hits album either, as there are a handful of touring newcomers that you don’t want to miss like The Foxies, Rainbow Girls, and Cicada Rhythm. Finally, most of the rest of the lineup is filled in by some of Knoxville’s finest talent. The Black Lillies and Cereus Bright are the highest up on the bill, and both bands have had a history of killing it at RnB. Plus, bands like Three Star Revival and Peak Physique are made for big festival audiences and their sets are going to be a ton of fun. There are a few Knoxville bands who are new to the fest as well like Jubal, Gamenight, and the hip-hop megagroup The Good Guy Collective. Rounding out the bottom of the lineup are some excellent singer/songwriters that you’ll likely find at some of the smaller, more intimate stages like Daje Morris, Adeem The Artist, and Joey English. This year’s Rhythm N’ Blooms will take place in Knoxville’s Old City on May 17th - 19th. Tickets are available now, and you can get more info at Rhythmnbloomsfest.com. We’ll have a whooooole lot more in terms of breaking down the festival lineup as the event gets closer and schedules have been released. For now, you can check out the full lineup below.